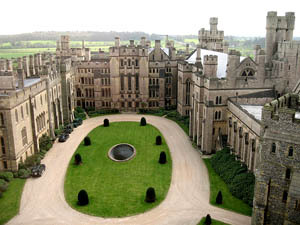 Arundel Castle is a restored medieval castle. It was founded by Roger de Montgomery on Christmas Day 1067. Roger became the first to hold the earldom of Arundel under William the Conqueror. From the 11th century onward, the castle has been in the family of the Duke of Norfolk, and is still the principal seat of the Howard family. The castle was damaged in the English Civil War and then restored in the 18th and 19th centuries. It is a Grade I listed building. The keep and gatehouse have been open to the public since 1800 and the gardens since 1854. 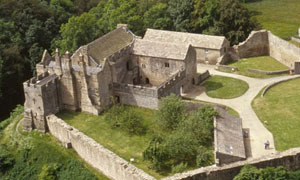 Today you can visit the keep, castle, chapel and gardens. There is a Restaurant and a Gift Shop, and a range of events in the grounds along with educational and private tours. The castle is also available as a film location and for Corporate Events, Conferences, Pivate Functions and Banquets. Aydon Castle is a fortified manor house. Almost completely intact, it is one of the finest and most unaltered examples of a 13th-century English manor house. Set in a secluded Northumberland woodland. It was originally built as an undefended residence, but almost immediately fortified on the outbreak of Anglo-Scottish wars. It was pillaged and burnt by the Scots in 1315, seized by English rebels two years later, and again occupied by Scots in 1346. The earliest stone buildings are the hall, chamber block and the garderobe; dateable to between 1280 and 1300.. Over the centuries the manor house had numerous owners, many of whom lived elsewhere and leased the property to tenants. 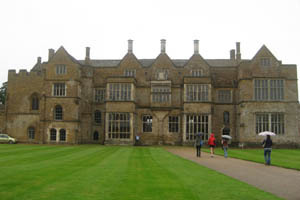 As a result the manor was left largely unchanged. The only significant modifications were made during a mid 16th century renovation, and a mid 17th century conversion to a farm. It is a Scheduled Ancient Monument and a Grade I listed building open to the public. Bamburgh Castle is an imposing medieval castle located on the coast at Bamburgh in Northumberland, England. It is a Grade I listed building. 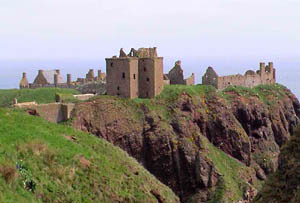 As an important English outpost, the castle was the target of raids from Scotland. From 1096 it was a royal castle. In 1464 during the Wars of the Roses, it became the first castle in England to be defeated by artillery, at the end of a nine-month siege by Richard Neville, 16th Earl of Warwick. The Forster family of Northumberland provided the Crown with twelve successive governors of the castle for some 400 years until the Crown granted ownership to Sir John Forster. 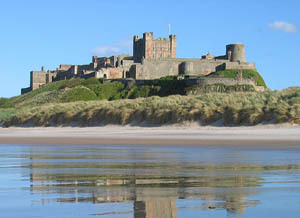 Spanning nine acres of land on its rocky plateau high above the Northumberland coastline Bamburgh is one of the largest inhabited castles in the country. It is open to the public. 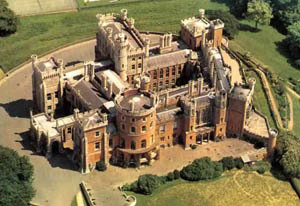 Belvoir Castle is a stately home in the English county of Leicestershire, overlooking the Vale of Belvoir. Belvoir castle has been the home of the Manners family for five hundred years, and seat of the dukes of Rutland for over three centuries. 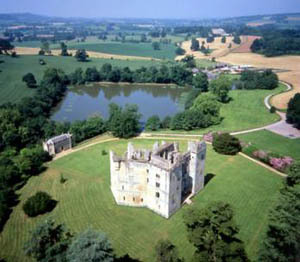 A corner of the castle is still used as the family home of the Manners family and remains the seat of the Dukes of Rutland. The present Castle is the fourth building to have stood on the site since Norman times.. It is a Grade I listed building. The castle is open to the public and contains many works of art. The castle is open to the public. Highlights include lavish staterooms, the most famous being the Elizabeth Saloon (named after the wife of the 5th Duke), the Regents Gallery and the Roman inspired State Dining Room.The castle sits in a vast estate of almost 15,000 acres (120 km²). The landscaped grounds, nearer the castle, are also open and the Root Houses, built by the fifth Duke's wife, can also be seen. The present Duchess is restoring Belvoir Gardens, which includes the Secret Valley Garden and the Rustic Summerhouse of 1800. Broughton Castle is a medieval manor house located in the village of Broughton. It was built as a manor house by Sir John de Broughton in 1300 at a location where the confluence of three streams created a natural site for a moated manor. Broughton fell into decay in the 19th century, but was eventually rescued by Frederick Fiennes, 16th Lord Saye and Sele, who brought in the prominent Victorian architect Sir George Gilbert Scott. It is still the home of the Saye and Sele family. It is open the public. EntryFee charged. Facilities include Washrooms, shop and cafe on site. Pub in Broughton village within a short walk. During the reign of Henry II the castle began to take recognisable shape. The inner and outer baileys and the great Keep belong to this time. The keep was one of the last rectangular keeps ever built. In 1216, a group of rebel barons invited Louis VIII of France to come and take the English crown. He had some success breaching the walls but was unable ultimately to take the castle. The castle, secret tunnels and surrounding land are now owned by English Heritage and the site is a major tourist attraction. 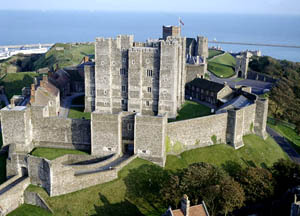 The Lord Warden of the Cinque Ports is officially head of the castle, in his conjoint position of Constable of Dover Castle, and the Deputy Constable has his residence in Constable's Gate. Hoghton Tower is a large fortified manor house near the village of Hoghton in the Borough of Chorley to the east of Preston in Lancashire. It has been the home of the De Hoghton family since the time of William the Conqueror. The dramatic manor house that you can see today is primarily a product of the mid-Tudor period. The house is built in an elongated figure-8, encompassing two inner courtyards entered through a castellated gatehouse. 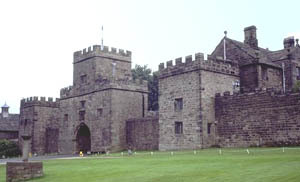 Hoghton Tower, a Grade I listed building is the ancestral home of the de Hoghton family. The de Hoghtons are descended directly from Harvey de Walter, one of the companions of William the Conqueror, and through the female line from Lady Godiva of Coventry, wife of Leofric, Earl of Mercia. Hoghton Tower is open to the public. 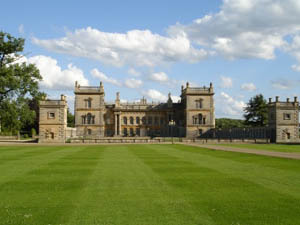 It hosts weddings and corporate and other events events it is a popular filming location. There is a shop and tea room for visitors. Wardour Castle is a ruined castle located near Tisbury in the English county of Wiltshire. The original castle was partially destroyed during the Civil War. 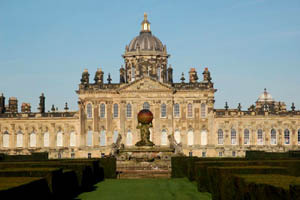 It is managed by English Heritage who have designated it as a grade I listed building, and is open to the public. It is open too the public. It lies within the ground of New Wardaour, a private house. The old castle became a fashionable romantic ruin, and in the 18th century was incorporated into the landscaped grounds of the New Wardour House (there is no public access to New Wardour House or grounds). There is an English Heritage audio tour, included in the ticket price, tells of Old Wardour’s past and the fighting it saw during the Civil War. 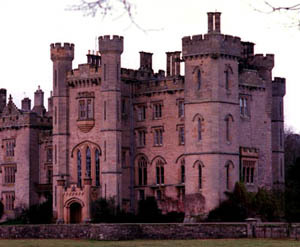 The castles, old and new, have been featured in several motion pictures. Powderham Castle was built between 1390 and 1420 by Sir Philip Courtenay, and has undergone several phases of expansion and restoration, especially in the 18th and 19th centuries, and most notably by James Wyatt in the 1790s. 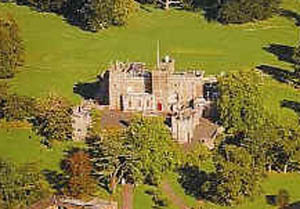 The Powderham Estate, in which it is set, runs down to the western shores of the estuary of the River Exe between the villages of Kenton and Starcross. The Castle remains in the hands of his descendant, the Earl of Devon. It is open to the public. 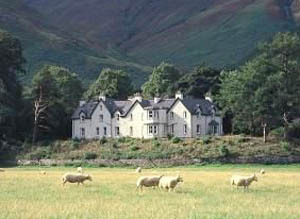 It has a deer park, educational visits to the kitchens, and farm shop. It hosts wedding receptions, childrens’parties, corporate events and private functions. It also sells mooring licenses on the River Exe.There are frequent events during the summer. The house allegedly has a haunted landing. 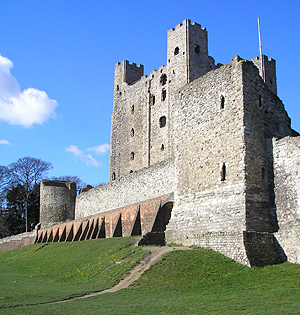 Rochester Castle stands on the east bank of the River Medway, in Rochester, Kent. It is one of the best-preserved castles of its kind in the UK. There has been a fortification on this site since Roman times (c AD43), though it is the keep of 1127 and the Norman castle which can be seen today. With the invention of gunpowder other types of defence became more appropriate, and the military centre of the Medway Towns moved to Chatham. The Tower of London (known simply as "The Tower", is a castle and scheduled monument in central London, England, on the north bank of the River Thames. It is technically Her Majesty's Royal Palace and Fortress. The Tower lies just outside the City of London, and is separated from the eastern edge of the City by the open space known as Tower Hill where public executions used to take place. The Tower of London is a concentric castle with two sets of curtain walls and a moat, with numerous buildings within the inner walls, dominated by the White Tower The White Tower is the original square fortress built by William the Conqueror in 1077 with a bailey. 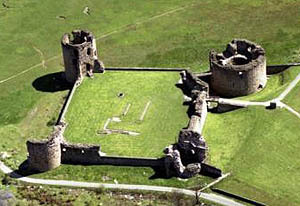 The tower remains largely unchanged but the baily has been replaced by two rings of castle walls. 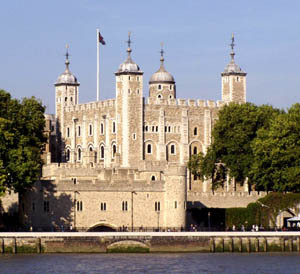 The Tower has served as a fortress, a royal palace and a prison, a place of execution and torture, an armoury, a treasury, a zoo, the Royal Mint, a public records office, an observatory, and since 1303, the home of the Crown Jewels of the United Kingdom. Many famous prisoners have enclosed here, especially state prisoners charged with treason. Warkworth Castle is a ruined, although well preserved castle, situated in Warkworth, Northumberland, England on a defensive mound in a loop of the River Coquet. It is a Grade I listed building. Warkworth Castle was originally constructed as a wooden fortress, some time after the Norman Conquest. It was later ceded to the Percy family, who held it, and resided there on and off until the 16th century. During this period the castle was rebuilt with sandstone curtain walls and was reinforced. 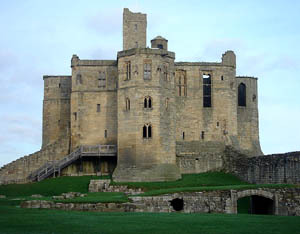 The imposing keep, overlooking the village of Warkworth was added during the late 14th century. 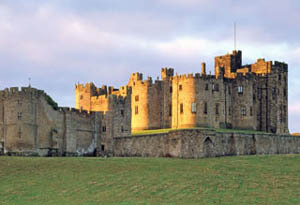 It was refurbished by the Dukes of Northumberland in the late 19th century. 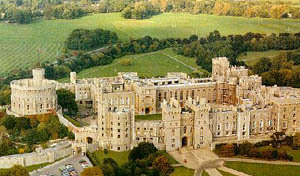 Windsor Castle is the oldest and largest occupied castle in the world and the Official Residence of Her Majesty Queen Elizabeth II. Its rich history spans almost 1000 years, dating back before the time of William the Conqueror. The Castle covers an area of about 5 hectares (13 acres) and contains magnificent State Apartments furnished with treasures from the Royal Collection, St George's Chapel (the burial place of 10 monarchs), and Queen Mary's Dolls House, a masterpiece in miniature. It is now a major tourist attraction, parts of it open to the public. During the winter months an additional five rooms, known collectively as the Semi-State Rooms, are included in the visitor route. Birkhill is the family home of the Earl and Countess of Dundee in Birkhill, Cupar in Fife. 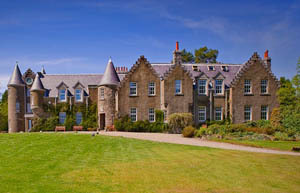 It is located on the shores of the river Tay a short distance from St Andrews. Set on the coast in North East Fife, Birkhill was built in 1780. The house is surrounded by gardens with rare trees and plants. Lord Dundee is the Hereditary Royal Standard Bearer for Scotland. His ancestors carried the Scottish Banner for William Wallace and Robert the Bruce. Bruce later appointed the Standard Bearer and his successors as custodians of the City of Dundee which lies just across the Tay. Blackness Castle is a 15th century fortress, near the village of Blackness, Scotland, on the south shore of the Firth of Forth. It was built, probably on the site of an earlier fort, by Sir George Crichton in the 1440s. At this time, Blackness was the main port serving the Royal Burgh of Linlithgow, one of the main residences of the Scottish monarch. The castle, together with the Crichton lands, passed to King James II of Scotland in 1453, and the castle has been crown property ever since. Crathes Castle is a 16th century castle near Banchory in the Aberdeenshire region of Scotland. This harled castle was built by the Burnetts of Leys and was held in that family for almost 400 years. 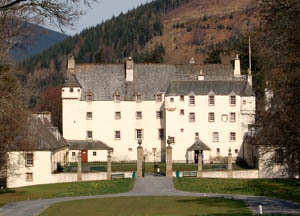 The castle and grounds are presently owned and managed by the National Trust for Scotland and are open to the public. 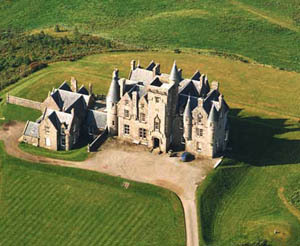 Crathes sits on land given as a gift to the Burnett of Leys family by King Robert the Bruce in 1323. 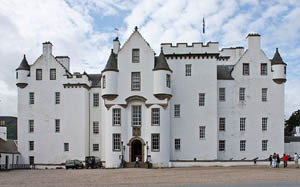 Construction of the current tower house of Crathes Castle was begun in 1553 but delayed several times during its construction due to political problems during the reign of Mary, Queen of Scots. 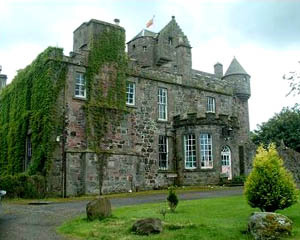 The castle dates from 1245, one of the oldest in Ayrshire and is situated within a small country estate with scenic views, near Fenwick. Estimates of the date of the oldest parts of the castle range from the 14th to the late 16th century, when it was simply a tower house. A wing from 1648 has been identified, but the gothic style frontage is from the early 19th century. The castle is still in private ownership. 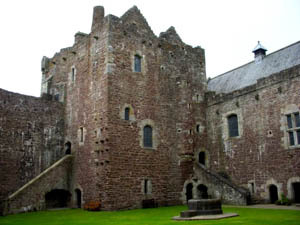 Doune Castle is a late 14th century stronghold near the village of Doune, in the Stirling district of central Scotland. The castle is sited on a wooded bend where the Ardoch Burn flows into the River Teith, across a bridge from the village. 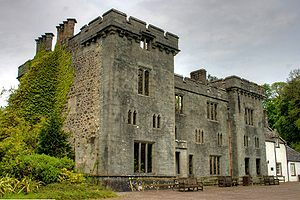 Doune is remarkable among Scottish castles, as it is the product of a single building period, and has survived relatively unchanged and complete. It was begun in the late 14th century by Robert Stewart, Duke of Albany (c.1340-1420), the son of King Robert II of Scotland, and Regent of Scotland from 1388 until his death. Drummond Castle in Muthill parish is a little south of Crieff, Perthshire. The oldest part is a tower-house built over several years by Sir John Drummond of Cargill, following the issue of a royal warrant by King James III in 1491. It is set on part of a prominent spine of rock known as the Gask Ridge, a geographical feature which stretches several kilometres across Perthshire, but is particularly prominent and steep-sided at the site of the castle. The original tower was ruined after Cromwell's siege in 1653. The upper stories were rebuilt (and heightened) in pseudo-medieval style in 1842-53, but the structure is no longer used as a dwelling. The keep is adjoined by a later, but better preserved, gatehouse (built 1629-30). 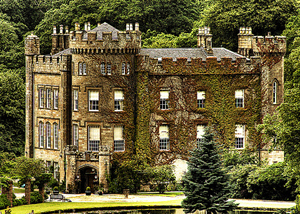 Duff House is a Georgian house in Banff, Scotland. It was designed by William Adam, and built between 1735 and 1740. It is regarded as one of Britain's finest Georgian houses. 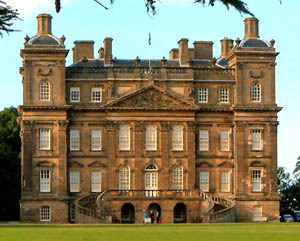 Duff House was built for William Duff of Braco, who became Earl Fife in 1759. Disputes over the castle reached such an intensity that Duff never lived here. It is said that he never even looked at the completed house, having his carriage blinds drawn whenever he passed by. 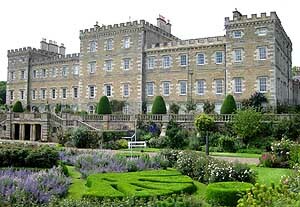 In the twentieth century Duff House was in turn a palm court hotel, a sanatorium and a prisoner of war camp. Since 1995 it has been part of the National Galleries of Scotland and houses a range of art treasures and superbly furnished rooms. It also hosts a programme of artistic events and is used as a base for artists and writers. Dundas Castle is a 15th century castle, with substantial 19th century additions by William Burn, near South Queensferry, to the west of Edinburgh. It was the home of the Dundas family. 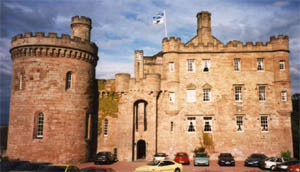 In 1416, James Dundas obtained a license to build a Keep from the first Duke of Albany, with an extension granted in 1436. It was primarily a defensive refuge. 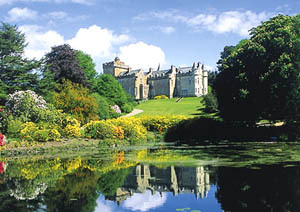 Oliver Cromwell is known to have stayed at Dundas Castle around the time of the Battle of Dunbar in 1650. 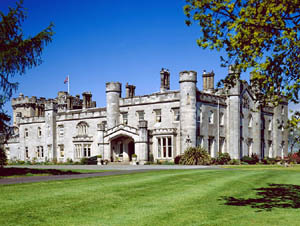 The modern Dundas Castle was built in 1818 by the renowned architect William Burn. Burn also designed many churches and this influence is visible throughout the building. Burn's designs for the main state rooms allow for huge windows that look out onto lawns and parkland outside. The Dundas family sold the property in 1846, but it remains in private ownership. Dunnottar Castle is a ruined medieval fortress located upon a rocky headland on the north-east coast of Scotland, about two miles (3 km) south of Stonehaven. The surviving buildings are largely of the 15th–16th centuries, but the site is believed to have been an early fortress of the Dark Ages. Dunnottar Castle played a strategic role in the history of Scotland from the Middle Ages through to the Enlightenment, because of the location: it overlooked the shipping lanes to northern Scotland; and is situated on a narrow coastal terrace that controlled land access to the coastal south via Portlethen Moss to Aberdeen. The site is open to the public, visited annually by hundreds of thousands of tourists. Duns Castle, Duns, Berwickshire is a historic house, the oldest part of which is the massive Norman Keep or Pele Tower, dating from 1320. 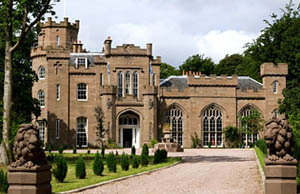 The earlier house was transformed into a Gothic castle, 1818-22, by architect James Gillespie Graham. 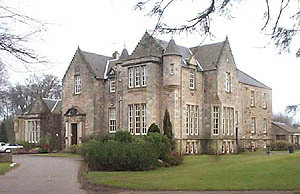 It is owned by the current Laird, Alexander Hay of Duns and Drumelzier. Alexander Hay (who was killed at the battle of Waterloo) reputedly haunts the castle. There is a publicly accessible park and two man made lakes, the Hen Poo and the smaller Mill Dam. 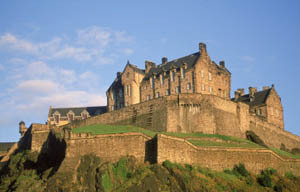 Edinburgh Castle is a castle fortress that dominates the skyline of the city of Edinburgh, from its position on top of the volcanic Castle Rock. Human habitation of the site dates back to the 9th century BC, although the nature of early settlement is unclear. The present castle dates from the 12th to 21st centuries. 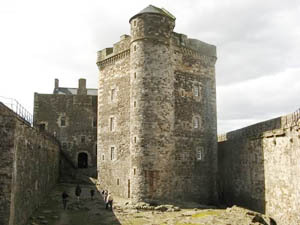 The castle saw many sieges and occupations during the Wars of Scottish Independence (1296 - 1357) and was besieged during the Lang Siege (1571 - 1573); and again in 1640, 1650, 1689, and 1745. The castle is still in use today for ceremonial and military purposes. The 52 Infantry Brigade is garrisoned here. It is now owned by the Ministry of Defence. It is open to the public. Parts are also rented for wedding receptions. Guthrie Castle is a castle and country house, located in the village of Guthrie, 18 miles north-east of Dundee in Angus, Scotland. The castle dates back to the 15th century, although much of the present building is of 19th century origin. It is now a private house, but is hired out as a venue for corporate events and weddings. 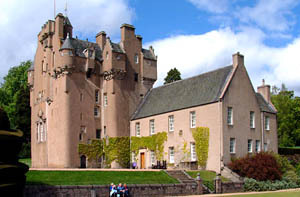 Guthrie Castle comprises a tower house, originally built by Sir David Guthrie (1435-1500), Treasurer and Lord Justice-General of Scotland, in 1468. The Guthrie family later built a house beside the tower. 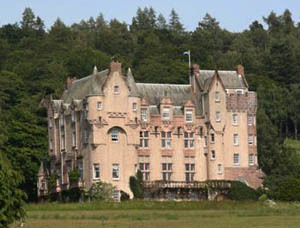 In 1848, the two were linked by a baronial style expansion, to designs by David Bryce. The historic keep remained in the Guthrie family until 1983, with the death of Colonel Ivan Guthrie. 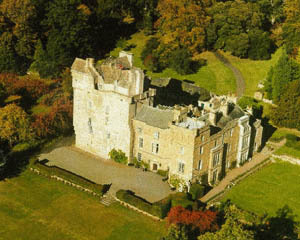 In 1984 Guthrie Castle was purchased by an American businessman who restored the castle to its 19th century condition, and built a golf course within the estate in 1994/95. 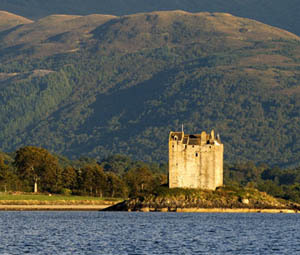 Hafton Castle is a magnificent building located in Hunter's Quay, just outside Dunoon, with views across Holy Loch. The Castle is set in its own gardens. The Castle was built by James Hunter. 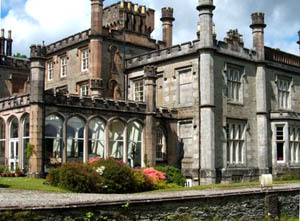 Its architect was David Hamilton who also designed Dunoon Castle. The building has some magnificent features, beautiful ceilings, carved doors and a superb staircase. Outside in the gardens are old trees, lawns and beautiful views across the Loch. 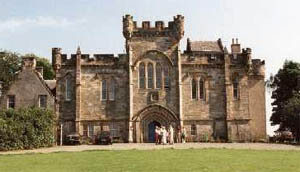 Dunoon itself is the home of the Cowal Highland Gathering and has a castle and museum. This Victorian shooting lodge stands in one of the most beautiful valleys of Wester Ross, half a mile from the head of Loch Broom and 8 miles from the idyllic fishing village of Ullapool. Once part of the Braemore Estate, Inverbroom has undergone careful refurbishment and modernisation sympathetic to the history of the property. The public rooms are decorated in rich, warm colours with timber floors and rugs. There are 10 bedrooms and nine bathrooms or shower rooms. The large kitchen is a delight for socialising with its modern, blue timber units, Aga and farmhouse dining table. The sitting room with open fire and large, comfortable sofas is very inviting and the rich, red dining room is conducive to after-dinner conversation. Kellie Castle is a castle located just outside Arncroach, about 5 kilometres north of Pittenweem in the East Neuk of Fife, Scotland. Originally a simple tower house, the lower section of what now constitutes the northwest tower is the oldest part of the castle, dating from around 1360, and is said to be haunted. In 1573 a new tower was built by the 4th Lord Oliphant to the east of the original tower. Between 1573 and 1606 the two towers were linked by a new range, terminated by another tower in the south-west, creating the T-plan layout that remains today. 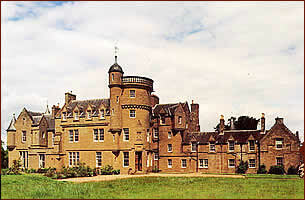 The castle is a fine example of Scots Baronial domestic architecture, with an imposing mix of gables, corbelled towers, and chimneys. 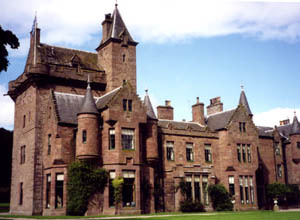 Megginch Castle in Perth and Kinross, in central Scotland, was built for the Hay family in the 15th Century, Originally a rectangular red sandstone tower house, begun before 1460, the castle was extended and remodelled by Peter Hay in 1575 to comprise three storeys and an attic. The Hays family sold the property to the Drummond family in 1664 and it has been extended in subsequent centuries. The gardens are notable, with four ancient yew trees each more than 1000 years old, topiary, an astrological garden, a sundial dating from 1572, a fountain parterre, a 17th-century rose garden and a walled garden with a long herbaceous border and ancient fruit trees. Several of the old pear and apple varieties are greatly valued. Myres Castle is a Scottish castle situated in Fife near the village of Auchtermuchty Its history is interleaved with that of nearby Falkland Palace. The lands of the present Myres estate originally formed part of the extensive properties of the Earl of Fife. The castle itself originated circa 1530 as a Z-plan fortress, perhaps designed by its owner John Scrimgeour, and has an ochre harled exterior with some exposed grey ashlar stonework on its square tower added in 1616. The tower is adorned with garland stonework, heraldic relief with carved initials and a parapet. The basement course appears to be an older, possibly 14th century piece, due to its barrel vaulted construction, and clear architecture of a medieval kitchen. Further modifications took place in the 17th and 18th centuries. At the property entrance there is a detached Victorian stone gatehouse, which was inhabited as a residence up to at least 1997. The prize of Myres is a spectacular walled garden featuring gigantic topiary yew trees, elaborate herbaceous borders and a small fishpond. Castle Stalker is a four-storey tower house or keep. 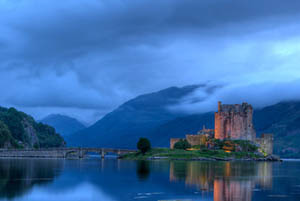 The Castle's picturesque appearance, with its bewitching island setting against a dramatic backdrop of mountains, has made it a favourite subject for postcards and calendars, and something of a cliché image of Scottish Highland scenery. Castle Stalker is entirely authentic; it is one of the best-preserved medieval tower-houses surviving in western Scotland. The original castle was a small fort, built around 1320 by Clan MacDougall who were then Lords of Lorn. Around 1388 the Stewarts took over the Lordship of Lorn, and it is believed that they built the castle in its present form around the 1440s. Castle Stalker is in private ownership, but the official website gives details of dates and arrangements by which visits can be made by appointment, subject to advance notice, weather and tides. Urquhart Castle was in its day one of the largest strongholds of medieval Scotland. Though now in ruins, having been slighted in the late seventeenth century, it remains an impressive structure, splendidly situated on a headland overlooking Loch Ness. 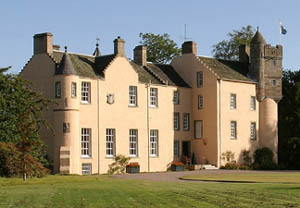 The castle is now owned by the National Trust for Scotland, and run by Historic Scotland as a site within the Guardianship of Scottish Ministers. It is Historic Scotland's 3rd busiest site. The majority of alleged Loch Ness Monster sightings occur in this location. In 2000-1, Historic Scotland undertook a major construction programme to create a visitor centre at the site, and to improve parking facilities. The visitor centre includes a display on the history of the site, including a series of finds from the medieval period, a cinema, a restaurant and shop. The Castle is open all year. There is an entrance charge. 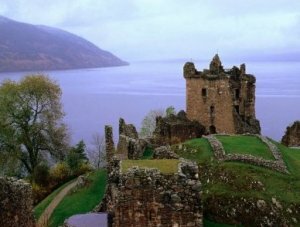 Urquhart Castle hosts marriage ceremonies. Beaumaris Castle is a great unfinished masterpiece. It was built as one link of the 'iron ring' of North Wales castles by the English monarch Edward I, to stamp his authority on the Welsh. Begun in 1295, this was the last and largest of the castles to be built by King Edward I in Wales during his programme of royal castle building. The castle is possibly the most sophisticated example of medieval military architecture in Britain and has few equals anywhere in the world. It is surrounded by a water-filled moat with a seaward entrance protecting a tidal dock and allowed supply ships to sail right up to the castle. Its symmetrical concentric design, involving four successive lines of fortifications, represented the state of the art for the late 13th century. This outstanding castle, built in Gritstone, is a World Heritage inscribed site. Bodelwyddan Castle is a fifteenth century castle in Denbighshire, Wales, originally built as manor house around 1460. 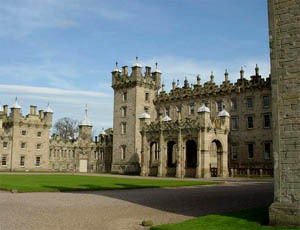 The castle that stands today was reconstructed between 1830 and 1852. 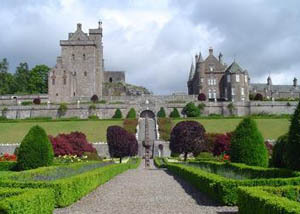 The castle is set in a large area of parkland, and formal gardens. It is a partner of the National Portrait Gallery and possesses a fine range of portraits. Both house and gardens are open to the public. 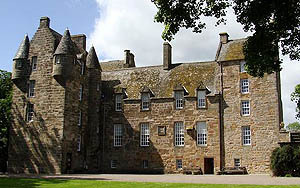 The castle offers tours and a range of educational services, along with other facilities for children. Rooms are available for private hire, and the castle is licenced for civil marriages. 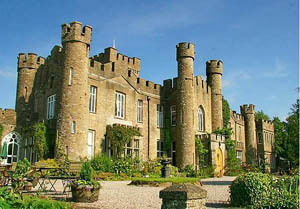 Bodelwyddan also hosts a wide range of events, including paranormal investigations. The castle grounds feature trenches built for troops to practice in during the First World War. 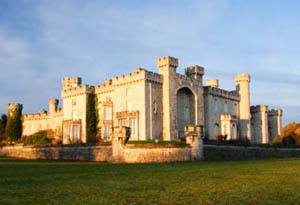 Bodelwyddan Castle is a Grade II* Listed Building. 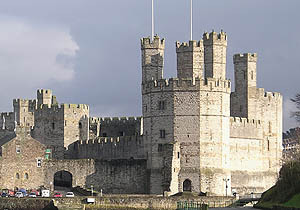 Caernarfon is a well preserved great stone castle, built by King Edward I. It is thought that Edward's architect, James of St. George, modelled the castle on the walls of Constantinople. On higher ground on the outskirts of the town are the remains of an earlier occupation, a Roman Fort called Segontium. It was besieged by Welsh rebels on several occasions and three times during the later English Civil War. On 1 July 1969 the investiture ceremony of Charles, Prince of Wales was held at Caernarfon Castle. It is open to the public. Caerphilly is a huge castle, well preserved with fascinating water defences. 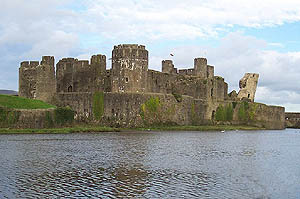 It is a medieval castle that dominates the centre of the town of Caerphilly in south Wales. 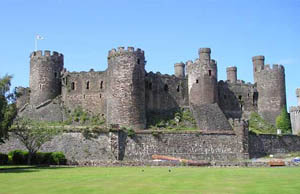 It is the largest castle in Wales and the second largest in Britain after Windsor Castle. Built mainly between 1268 and 1271, it is an early example of a concentric castle with extensive water defences. The castle is now a tourist attraction and includes a small shop in between its two main bridges. It is also licensed to perform wedding ceremonies - the Great Hall providing facilities for 100 guests. Fishing is available in the north and south lakes for carp and other coarse fish. Cardiff Castle is a medieval castle but also a nineteenth century Gothic Revival mansion. Located in Cardiff, the capital of Wales, this is a castle that has been transformed from a Norman keep into a Victorian fantasy of a medieval castle. The Norman keep, of which the shell remains, was constructed about 1091 by Robert Fitzhamon, lord of Gloucester and conqueror of Glamorgan. The keep was built on a motte on the site of a Roman castrum, first uncovered during the building campaign of the third Marquis of Bute in the nineteenth century. 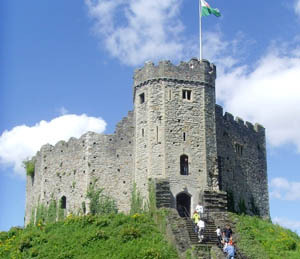 Today the castle is run by Cardiff Council and is open to the public. The Victorian interiors are spectacular. 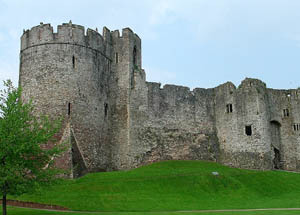 Chepstow Castle is the oldest surviving stone fortification in Britain. It was built on the the instructions of the Norman lord William fitzOsbern, soon to be made Earl of Hereford. 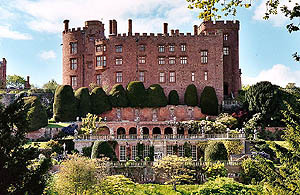 The castle was started in 1067, and was to become the southernmost of King Edward I's "iron ring" of castles built along the English-Welsh border in the Welsh Marches. Today Chepstow Castle is open to the public, and since 1984 has been in the care of Cadw. There are special events held often in the castle and visitors are able to walk along the battlements and into Martens Tower. Conway Castle is a medieval royal castle in Conway, on the north coast of Wales. It was built between 1283 and 1289 during King Edward I's second campaign in North Wales as one of the fortresses in his 'iron ring' of castles to contain the Welsh. In comparison to other great Edwardian castles it is relatively straightforward in design, a reflection of the inherent strength of its siting. It was captured after a three-month siege by the Parliamentary army in 1646 after which it was slighted so that today is little more than an empty shell. 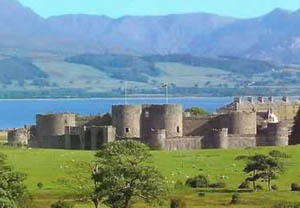 It is part of a World Heritage Site along with three others of Edward's Welsh castles. Denbigh Castle is one of the fortresses built after the 13th-century conquest of Wales by Edward I. It was defended by a unique triple-towered gateway. 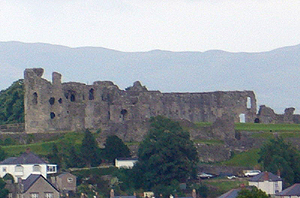 The castle stands on a rocky promontory above the Welsh market town of Denbigh, Denbighshire. It was built on the site of a former Welsh stronghold controlled by Dafydd ap Gruffydd, the brother of Llywelyn the Last. Denbigh castle is now managed by Cadw and is open to the public. Flint Castle was the first of the series of castles built during King Edward I's campaign to conquer Wales. Flint was therefore the first castle of what would later become known as Edward I's "Iron Ring", a chain of fortresses designed to encircle North Wales and suppress the Welsh. Its construction began almost immediately after Edward I began his First Welsh War in 1277.The site was chosen for its strategic position. The castle was only one day's march from Chester, supplies could be brought along the River Dee and there was also a ford across to England that could be used at low tide. During the English Civil War, Flint Castle was held by the Royalists. It was finally captured by the Parliamentarians in 1647 after a three-month siege. To prevent its reuse in the conflict, the castle was then slighted in accordance with Cromwell's destruction order. The ruins are what remain today. Flint Castle has been managed as public monument for 90 years, and is now maintained by Cadw. Access is free and via a path. Most parts of the castle, such as the isolated keep, are open to the public. Harlech Castle is a concentric castle, constructed an top of a cliff close to the Irish Sea. 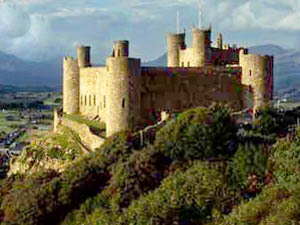 Harlech was one of 14 castles built by Edward I in the closing decades of the 13th century. It was besieged repeatedly durig the Welsh Wars, during the Wars of the Roses and again during the English Civil War. During the English Civil War It withstood the longest known siege in the history of the British Isles – seven years. Following the defeat of the Lancastrians at the Battle of Towton, during the the Wars of the Roses, Edward IV of England (1461–1470) controlled the country and Harlech became last major stronghold under Lancastrian control. 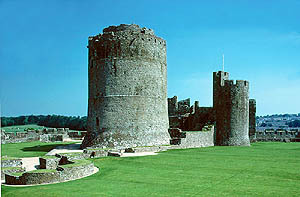 Architecturally, it is notable for its massive gatehouse.The castle is now in the care of Cadw and is open to visitors. Pembroke Castle is a medieval castle in Pembroke in West Wales. The castle is sited on a strategic rocky promontory by Pembroke River. The present structure owes much to William Marshal, "The Flower of Courtesy", one of the most powerful men in 12th-Century Britain. It was owned by a long succession of families and saw action in many wars and uprisings over the centuries. Today, the castle is open to the public. It remains the largest privately-owned castle in Wales. 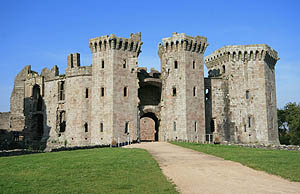 Raglan Castle is a late medieval castle located just north of the village of Raglan in the county of Monmouthshire in south east Wales. Its origins lie in the 12th century but the ruins visible today date from the 15th century and later. The peak of the power and splendour of the castle came in the 15th century and 16th centuries, as the Marches fortress of the great family of Herbert. Its ruin came at the end of one of the longest sieges of the English Civil War. After it fell, systematic slighting of the castle was undertaken and the Great Tower was largely destroyed by mining. In the 20th century, the Dukes of Beaufort placed the castle in the care of the state. It is presently administered by Cadw.